Impressions of the Cwejman MMF-2 stereo multi-mode filter. Buy the album to access the full recordings (10 tracks, 55 mins). The MMF-2 can be used to process mono or stereo signals. The filters can be run in parallel, or if patched, in series. It features two types of saturation and a dry/ wet mix. For a full description, see the MMF-2 product page linked above. The MMF-2 shares much in common with the MMF-6. It's confident, bold and, to my taste, more musical than its single-sibling. It FMs beautifully and, when oscillating with some saturation, can be used for plucked/ percussive sounds or aggressive basslines. 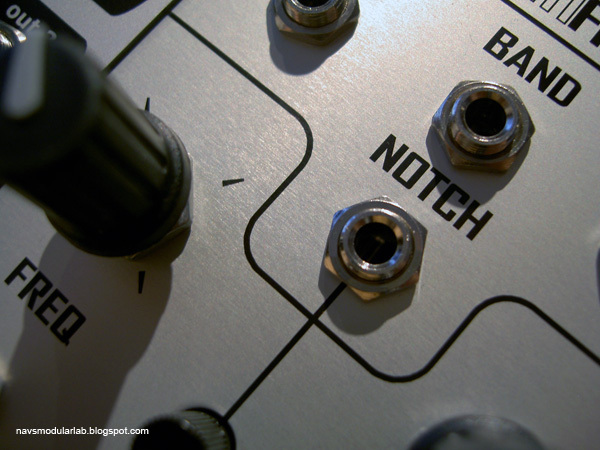 It can also be self-patched to make crazy, chaotic noise. It really comes alive when using the mix feature. Here are some thoughts that cropped up in use: the initial frequencies of the left and right channels need to be manually balanced in stereo patches. 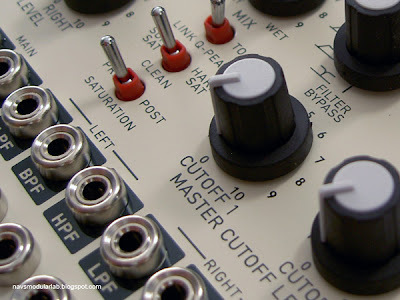 You can't sweep the entire frequency range with the master as the L&R cutoff pots are offsets. Inter-channel CV normalization and attenu-verters would be useful e.g. in a LP/ HP configuration. The filter slopes might be too steep for some external audio processing tasks. Saturation is either on or off, but the amount is determined by the input level. I would have liked an input VCA but, as Wowa told me, the MMF-2 is already 'a beast', both in terms of size and stereo circuitry. The MMF-2 can be clean or brutal, used to transform mono or stereo signals or even as a dual voice module. Look out for the next run. Thanks to Wowa for answering my questions and to Schneidersbuero for the loan. Wave-shaping with state variable multi-mode filters, or how to integrate a square into a saw. 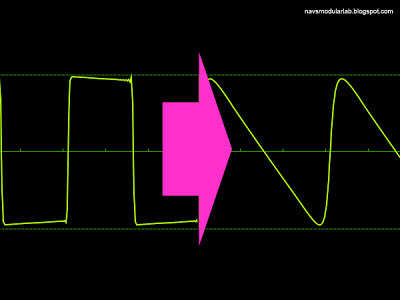 Send a square to the input of your filter and monitor the lowpass output. Wind the frequency knob back until you get something resembling a triangle. Patch the bandpass output to the CV input and start to raise the resonance. Play with the input level, amount of feedback and resonance until you get something resembling a saw. It won't have a perfectly vertical flank, but it's pretty close. This patch works because of phase offsets between the lowpass and bandpass outputs. Positive feedback will give you a saw, negative feedback a ramp. If you increase the amount of feedback, you'll be able to generate sub-harmonics of the input frequency. If you send your pitch CV to both the VCO and 1V/O input of your filter, the saws should maintain their shape as the frequency changes. 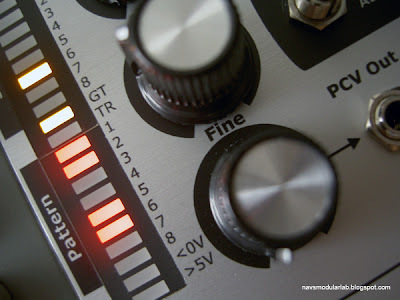 Hands-on preview of Fonitronik's novel 8-step CV & Gate sequencer. The mh11 offers a new take on the basic sequencer concept. An analogue to digital converter generates 256 patterns. The notes and direction stay the same, but the sequence of steps that actually get played is under manual or voltage control. For more on the concept, see Matthias' own description and video. Here's a demo of the effect of CV-ing the pattern on notes played & (0:34) gate length and (0:57) the mh11 as graphic VCO. To understand what's happening, feed the mh11 a clock and set all step switches to the up/ on position. All steps play. Then 'mute' certain steps by setting the switch to the off position. The ADC is used to automate this muting - it generates an 8-bit string of on & off values which is AND gated with the incoming clock. To test this, stop the sequencer, set all switches down to the ADC position and turn the manual PCV pot until all lights of the pattern LED-bar are lit. Restart the sequencer and turn the pattern knob. Any incoming CV is summed with the manual offset to generate a new string of on & off values. Programming the mh11 is easiest with another sequencer or S&H (running at a clock division) or a S&H-synchronized manual CV from Pressure Points. This is because the ADC 're-computes' the pattern with every change. You can use an LFO, but depending on the speed, things can get glitchy. At audio-rates, as per the graphic VCO example, this is not a problem. The 4MS PEG makes a good partner for the mh11 as its swings can be synced. In use, I found a few minor issues: if fed more than 8V, the ADC can lock up. Remove the external CV and twist the offset pot to reset it. I felt this offset should be inverted so that one can start with all steps on and then progressively mute them with a +ve CV. The output CV droops slightly when passively multed, so you may want to buffer it. Finally, the ADC controls both the CV and gate signals. Muting a trigger or tying a gate also mutes the CV. So, you can't send the CV to two VCOs and have one follow the pattern and the other the master clock. I asked Matthias whether this could be changed, but quickly realized it would require a second, parallel ADC. The build quality is solid, the layout generous and the LEDs give good visual feedback of the ADC's current pattern. A microprocessor-based sequencer might offer more options, but I do get a kick out of imaginative designs like the mh11. Thanks to Matthias for the loan of the module and for keeping it analogue! Basic Electricity #7 - Concert Tonight! A reminder of BE#7: tonight's gig with Hainbach, Electronicpresskit & Trouby Modular. Doors open at 21:00, music at 22:00 sharp at the cinema on Kastanienallee 77, 10435 Berlin Prenzlauer Berg. Brave the cold tonight and snuggle up in a cosy Kino with some great music, chilled IPA and special snacks! 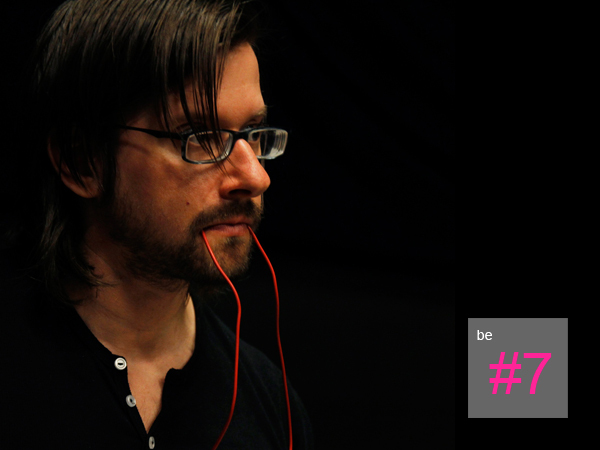 The next Basic Electricity concert is on Friday week, 16th November. We've got another great line-up with Hainbach, Electronicpresskit and Trouby Modular. See the BE blog and Facebook event for more. Here are some pictures from BE#6 with Derek Holzer, Vanessa Ramos-Velasquez and JenaMu6. Thanks to everyone who came and see you at BE#7!